It might be bring a smile to your face to recall the very first time you ever set foot in a Porsche. I had just that experience this week. 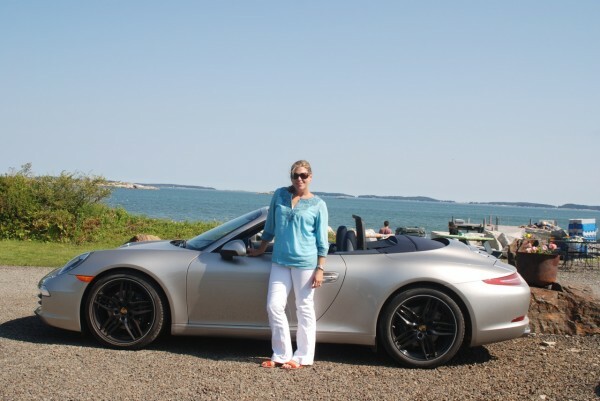 My daughter-in-law offered a leisurely drive along the Maine coast in a 2012 911 Carrera Cabriolet. Perfect weather; light traffic; narrow and winding freshly paved roads; steep hills; challenging country curves all lay ahead. Should be fun, I thought, as I innocently plopped myself into the passenger seat of the shiny new 911. This would be my first time ever in a Porsche. I had no idea what was in store for me. The 2012 Porsche 911 Carrera Cabriolet and my "Pilot" who you know as "PepperGirl"
It was a beautiful, perfect late summer day. The Porsche's cabriolet top unlatched itself from above the windscreen and stored quickly somewhere into the rear. With the press of another button, a windscreen silently popped up behind my head across the full length of the vehicle. At 6' 4" and nearly 240 lbs I was amazed at the room available to stretch out. From the outside it didn't seem possible, but I fit easily. Even though this particular 911 was a cabriolet, I had plenty of head room. I was low to the ground but had an excellent view all around. The Porsche fit me like a glove... and I was just the passenger. The pilot to my left seemed even more comfortable as first gear was engaged and we departed the driveway. Before I could even think about it, she was in second gear and 70 mph loomed large on the instrument panel as a guage lit up in yellow then red indicating a shift point [Editor's note: The 7spd manual transmission comes equipped with a Gearshift Assistant that indicates shift points over 5000 RPMs]. As she shifted into third I became acutely aware of how comfortable the seat I was pressed into felt. The roar from the engine and exhaust seemed to flood my ears with an aural overload. We were moving so fast in those first few seconds that I instinctively pressed my foot to the floorboard looking for the brake pedal... (just like my mother... years ago when I would drive too fast on the highway). Just as it seemed things were calming down we closed on a group of slower moving cars. With a lightning quick downshift, from 3rd to 2nd, the Porsche accelerated past the four slower moving cars with an ease that made it seem nearly effortless. It was over before I knew it. The 911 seemed to dig deeper into the road the faster we moved [Editor's Note: The 2012 911 Cabriolet has 350 hp, a top speed of 179 mph and a conservatively estimated 0 to 60 time of 4.6 seconds with the manual transmission] . As we approached curves in the road, I expected she would slow to a more reasonable speed but we continued to accelerate. The way this Porsche handled you would think it was a curve straightening machine. At about this point, I relaxed and resumed breathing. A red light on the instrument panel indicated we had been pulling nearly a full g at our maximum acceleration. Not to worry. The style, the speed, the handling of the new 911 were all working together to impressed me deeply. But it was the stopping power of this vehicle that really blew me away. I never expected it! Pressing a few buttons on center console, my pilot demonstrated a distinct change in pitch or sound of the Porsche's exhaust [Editor's note: Our 911 Cabriolet was equipped with the Sports Exhaust option]. More than a few farm tractors stopped short in the fields to look up as we whizzed by. I'm certain they anticipated a loud crash as we crested the next hill and rounded the corner. Yet another console button changed the suspension [Editor's Note: We had the Sports Chrono option that gave us a Sports Plus button] so that we could now feel every ripple, crack and dent in the road. My experience won't surprise any of you who are veteran Porsche owners (or passengers). I'm sure you can explain the mechanics and the engineering far better than I. But for those of you who may have never even driven in a Porsche before... please, give it a try. You will be amazed, too. I promise. I just recently became a licensed pilot and have been in the market for a small plane for the last few months. I'm now thinking maybe I need a Porsche instead. One serious tip, however... make sure you have an experienced driver to show you what a Porsche can do and a safe place to do it. You do need to know how to drive well to handle this machine at its limits [Editors Note: We never got anywhere near the limits of this 911]. I can't imagine owning such a powerful beast without frequent access to a well qualified track and tutor. So, do you remember your first ride in a Porsche? This post was written by my father-in-law, Bob Irving. I didn't request it and surely didn't expect it, but after his ride with me in the 2012 Porsche 911 Cabriolet that Porsche lent us for the week, he felt compelled to contribute and share. Thank you, Pepper Girl ! Very entertaining article – what could be better than a blast through the rural landscape in a new Porsche cab with a pretty young girl at the wheel? I would have to fight for a turn at the wheel, though. See, now I want one butI still love my older Porsche – life is not fair! Thanks for sharing – your enthusiasm, awareness and overall reaction are reflected very well by your words. Not everyone can fully appreciate the uniqueness and totallity of the Porsche experience – one you will never forget or experience in another make, at any price!